In many culinary corners of NYC, 2018 is the year of meat on a stick. Here are the meals we think will stick around. The preponderance of food on sticks didn’t suddenly rise for easy #FoodInTheAir ops. Skewering is actually one of the most ancient means of cooking—you can even find evidence of shish kabob feasts in the Illiad (1.465). And meat cooked on sticks is prevalent across many cultures, from Japanese to African, often as a popular street food. Restaurants in NYC, though, have transformed this ancient, prosaic snack into heightened fine dining. Maybe it’s a bit of nostalgia for the simpler days or maybe it’s the Instagrammers. Either way, 2018 has been filled with stick food. Although yakitori is widely appreciated as one of Japan’s famous dishes, it was only introduced there in the mid-1800s due to restrictions on eating meat during the Buddhist-influenced Edo period. Chicken was not completely banned, but the smell of grilled meats was considered crass. With the fall of the empire, yakitori became readily accessible as an easy snack in street halls. As it grew in popularity, it established itself as a staple for Tokyo’s salarymen to scarf down with voluminous amounts of cold beer. Cuts of meat were seasoned with soy and salt and then cooked over charcoal. NoNoNo’s modern space is an upgrade from Tokyo’s street halls, but it keeps in line with the tradition of cooking each part of the animal. 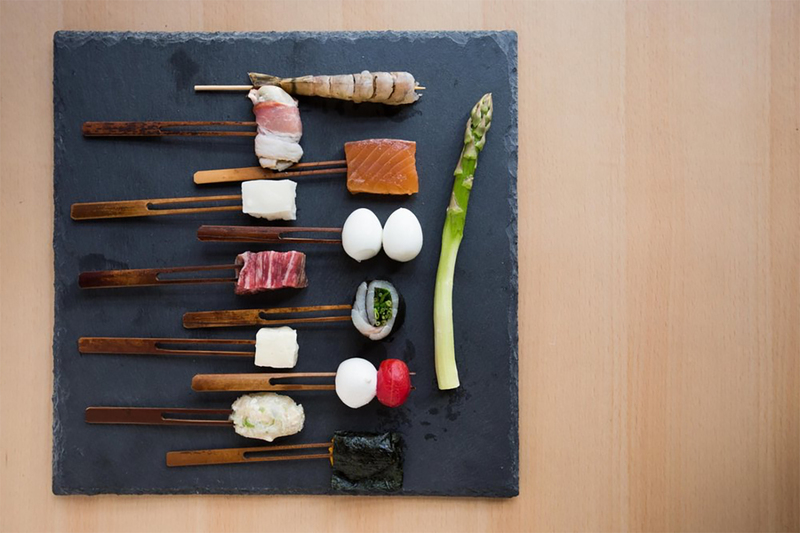 In addition to obscure cuts like heart, chicken oyster, gizzard, and cartilage, it also offers inventive skewers like the tamago bacon (soft cooked egg wrapped in bacon with truffle salt). Wash it all down with an Orion on draft like a salaryman would. 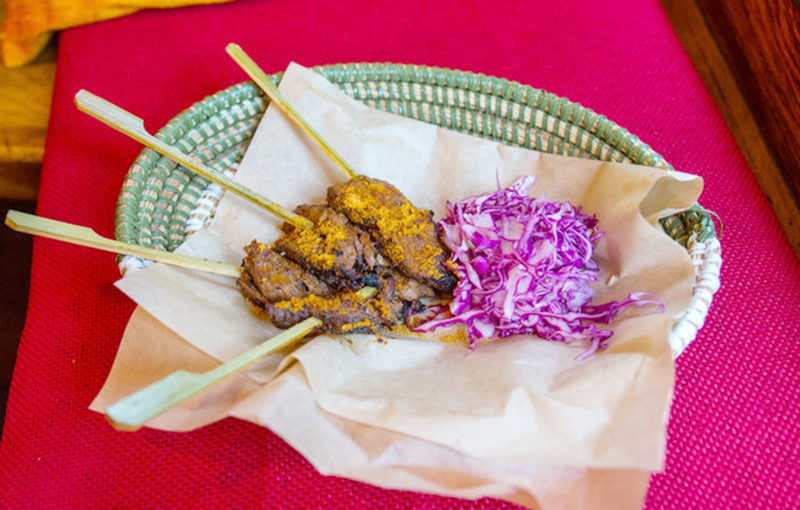 The satay (or sate) came to Southeast Asia by way of Indian merchants selling kebabs on the streets of Indonesia in the 18th century. As the kebab passed through Indonesia’s neighboring countries, they each adopted this cooking style as their own. In Thailand, a satay is almost exclusively paired with a thick peanut sauce, unlike other places, where it is eaten plain or in a vinegar-based sauce. The newish Sala Thai is from the same people who brought us Up Thai, an Upper East Side favorite. Unlike other country’s preparations, the chicken skewer here is served as one flat piece strung along the stick. Sala Thai dolls up the presentation by presenting the satays upright in a beautiful wood bowl, alongside pickled vegetables, grilled flatbread, and peanut sauce. Dip the turmeric-flavored chicken generously in the creamy peanut sauce. Much like yakitori, kushiage (also known as kushikatsui and is fried as opposed to grilled) originated as a snack for the Japanese working population. In 1929, Osaka restaurant Daruma started serving this simple street food to laborers. Even today, Daruma has lines around the block for these fried meat skewers. Chef Chikara Yamada gives kushiage an upgrade with imaginative combinations like bacon-wrapped oysters and quail eggs with truffle. Though the meat skewers typically cost well under the $180 prix fixe dinner here, Yamada’s prestige is well worth the high price point. A former chef at El Bulli, Yamada taps into his Spanish food background and uses molecular gastronomy to add haute cuisine flair—think: liquefied “homemade olives” and Spanish omelets topped with Japanese dashi and truffles—to the Japanese staple. Georgian cuisine interplays many of the traditions carried along the Silk Road, a true embrace of the East and West. The Georgians prepare their shish kababs with ground meats infused with herbs and spices, then grill them over charcoal. Because they are not a Jewish or Muslim community, Georgian kababs come in pork options, as well. Georgian Dream’s kabobs are, well, a Georgian dream in Bay Ridge. The fatty ground pork kababs are wrapped in a flatbread, then topped with raw onions and pomegranate seeds alongside delicious thick-cut french fries, which are smooth on the inside with a golden brown crisped exterior. For the caloric-conscious, kababs are also available in chicken, sheep, and lamb without the flatbread. 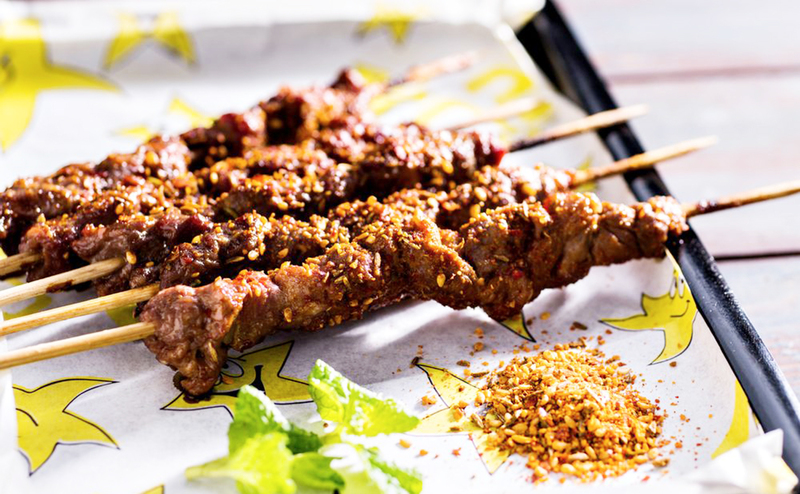 Chuanr—meat skewers spiced with cumin seeds, dried red pepper flakes, and sesame oil or seeds—were brought to the northeast region of China by the Uyghur, a Turkish immigrant group. Its cuisine mixes Middle Eastern and Asian influences through the use of spices and preparations from both traditions. Now, as in Japan, these skewers have spread throughout the country as a popular street food. At Le Sia, succulent lamb chuanr is cooked over charcoal and seasoned as it is in China with cumin and red pepper flakes. Don’t hold back from ordering up the identically spiced chicken, beef, and zucchini skewers. Indulge as well in some of the more unique options, like the scallop (cooked on a skewer) placed atop sesame-dressed glass noodles in the shell. 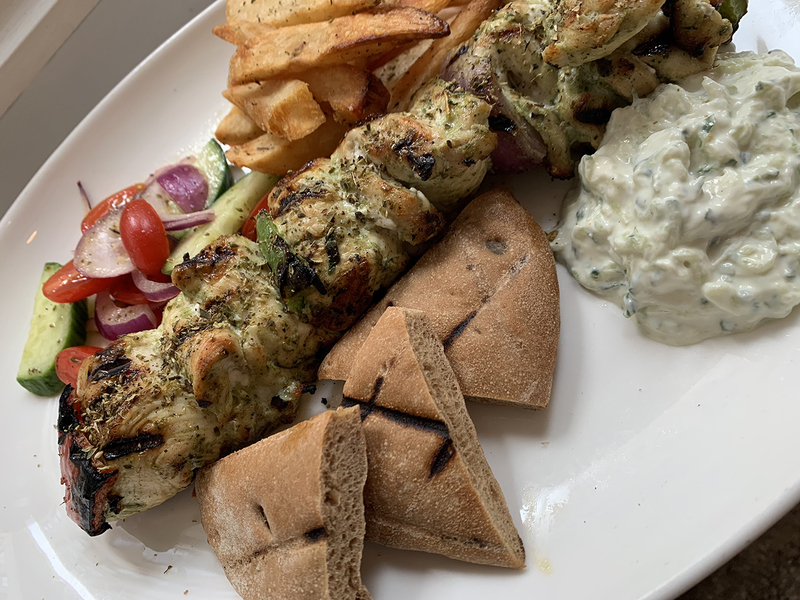 Greeks and Turks fight over whether souvlaki is really just a Greek adaption of the shish kebab or if it was developed independently in Ancient Greece. Signs of cooking meats on skewers were found through excavations that can be dated back to before the 17th century B.C. Luckily, our taste buds don’t discriminate. Flatiron hot spot Kyma houses a buzzy crowd by night but offers some more casual offerings at lunch. Its midday meal is set with traditional appetizers like avgolemono (egg-lemon soup); spanakopita; and grilled octopus with roasted peppers, onions, and capers. For your main, chow down on succulent chicken souvlaki dipped in tzatziki along with “Greek fries” (thick-cut potatoes) in this whitewashed space reminiscent of eateries in Mykonos. The Druze community living in Israel traces its heritage back to the Middle East, which accounts for much of the similarities in cooking style. Halabi, named after the city of Aleppo (Halab), is traditionally prepared with spicy tomato sauce and pepper. When Halabi is your last name, you know how to do it well. Gazala Halabi’s restaurant has finally returned to the Upper West Side, serving food inspired by her family; her grandmother owned a spice shop and her parents owned a restaurant in Israel. 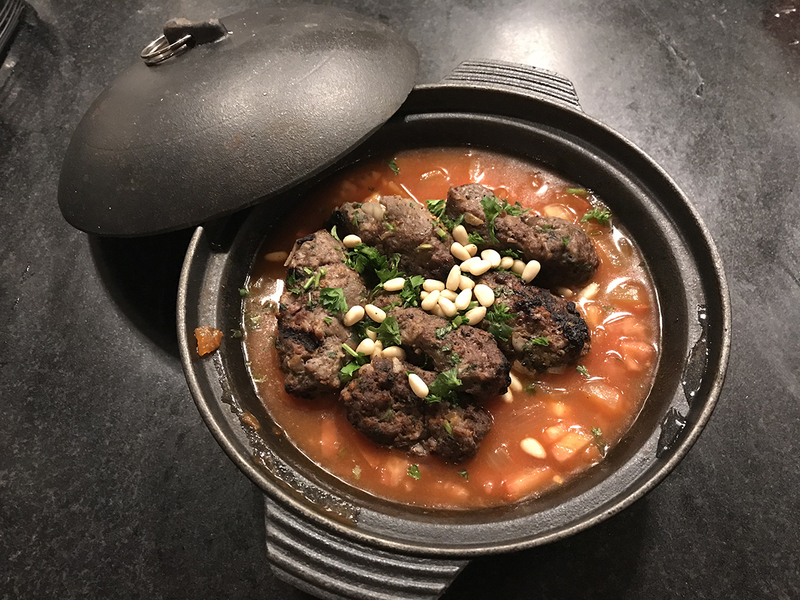 Gazala’s halabi combines beef and lamb with fresh chopped parsley and onions, served on a bed of house-made tomato sauce topped with toasted pine nuts. Spices and olive oils are sourced from Lebanon to ensure authenticity of flavors. Similar to the Silk Road countries, Peru’s anticuchos developed from an ancient people’s food to a popular street snack. These Peruvian specialties were originally cooked with llama offal in the 16th century. Nowadays, beef heart skewers can be grabbed as a snack across the country. 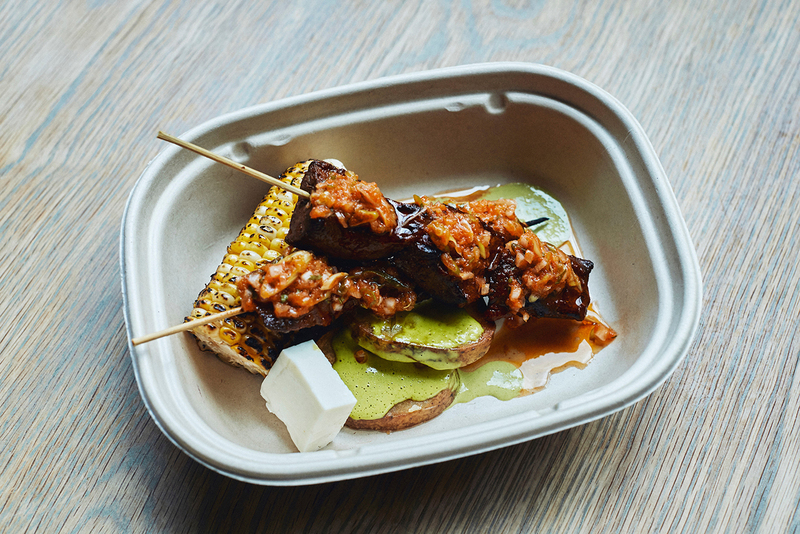 Llamita, a fast-casual spot in the West Village, makes sandwiches and salads alongside Peruvian specialties. Its beef heart anticucho is served with the usual accompaniments of potatoes, corn, queso fresco, and aji verde (a sauce made from garlic, onion, chopped cilantro, vinegar, and lemon juice). If you’ve never had heart before, be prepared for a bit of a chewier texture and a meat packed with flavor more reminiscent of foie gras than a typical slice of steak. 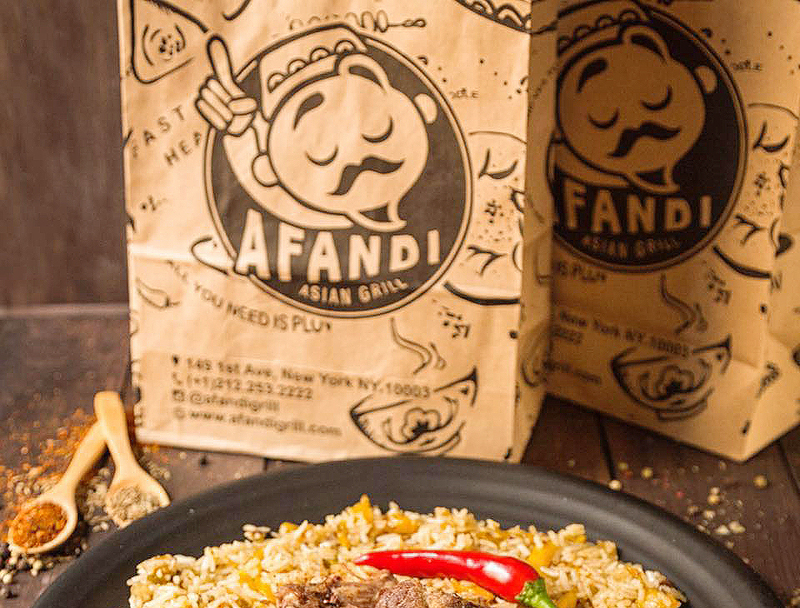 Afandi Grill takes its name from a folklore tale prominent in Silk Road countries, about a wise traveler of the same name. The restaurant transports the imagined recipes and culinary secrets Afandi garnered traveling across Uzbekistan, Kazakhstan, and China to New York’s East Village. The Afandi illustration that appears on its paper products looks like an Uzbek Pringles mascot. Talk about fusion! The Afandi kabob is served on a flat metal skewer on top of aromatic rice, along with a simple salad and fries. The spices used to cook the meat—cumin, cayenne, and coriander—are ones found from all over the Silk Road. Much like arguments over barbecue in the United States, different regions of Nigeria claim superiority in their preparation of suya. These grilled meats may look the same, but will taste drastically different in neighboring locales depending on their popular spices. 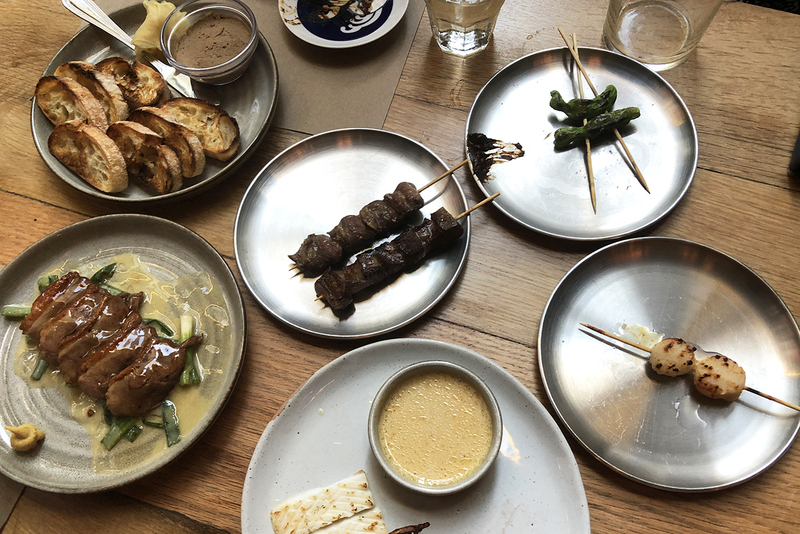 Greenwich Village’s Berber Street Food fuses African traditions with some French and Asian influences that come from chef Diana Tandia’s personal experience in famed NYC kitchens like Daniel and Per Se. Her grilled sirloin suya brochettes, accompanied by purple cabbage salad, are served in a woven bowl lined with paper. The intricate flavors of fried and ground peanuts, ginger, red pepper, salt, and nutmeg will take any visitor straight to the streets of Nigeria. Indian kebabs trace back to the Mughal Empire, which brought traditions from Central Asia to India. 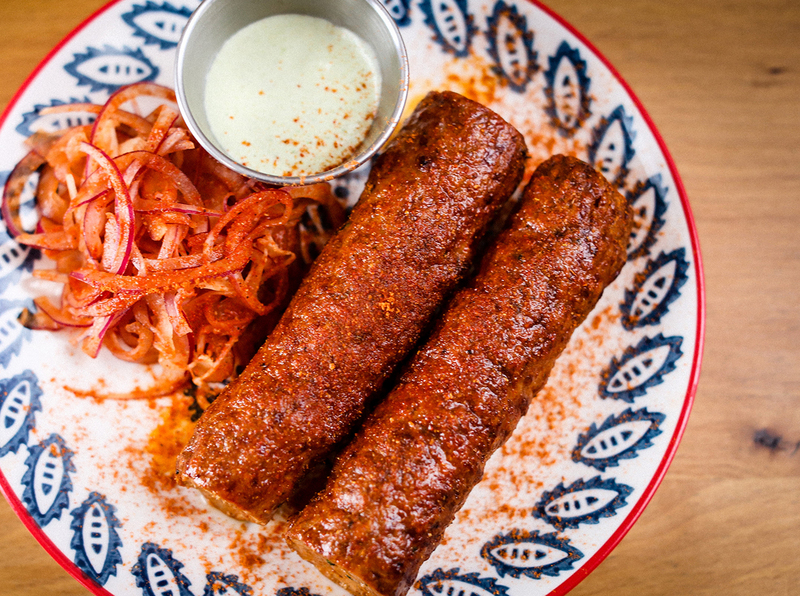 What differentiates these kababs from the rest are that the meats are ground and the local spices like cumin, curry, and tamarind give the skewer a distinct flavor. The meats are also prepared within a clay or metal tandoor, which cooks the kababs simultaneously by live fire, convection cooking, and smoking as a result of the meat drippings falling onto the fire. The Rahi team switched their focus from fine dining to street food at their homey Long Island City spot. Adda’s menu features an entire section of tandoor grilled items, most notably the kababs. Executive chef Chintan Pandya prepares these lamb kababs in the seekh style, plated alongside fried onions, green chili, and mint. Hungry for more content? Read on for what else we’re craving lately.